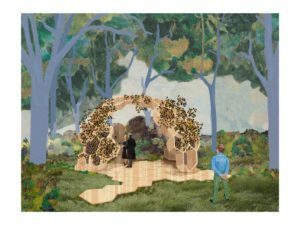 McQueens Flowers has been commissioned by the RHS to create two original art installations at the Chelsea Flower Show, 21 – 25 May. Honey, I’m home will be an interactive installation, inviting visitors to help create a swarm of giant honey bees flying home to their hive. The second will be a dramatic 20m long by 7m wide dark immersive tunnel Per Oculus Apum (Through the Eyes of Bees) complete with upside-down lavender field. Both will open visitors’ minds to how bees see the world and ultimately raise awareness of the recent decline in the bee population. The installations educate visitors about how bees see flowers and the crucial role that they play in producing a third of the food we eat. The aim is to emphasise the plight of bees, the importance of nurturing the bee population and indirectly invite people to join the campaign to save them. A bee hive will be depicted with an igloo-like hexagonal honeycomb, seen in the image to the left. Taking two days to build it will be the focus of The Artisan & Tree Tops Area installation. Under the guidance of McQueens Flower School, visitors will be invited into the hive to make their own 3D bee to help create an original site-responsive artwork. Bees will be modelled out of dried leaves, wood and Craspedia flowers which will then be added to the hive. The hive will start off empty at the beginning of the week and McQueens hopes that it will be full by the end of the show with at least 2,000 #mcqueensbees – with many sharing these on social media. Honey, I’m home will deliver the message of the crucial work that bees play in pollination and helping to keep the plant kingdom alive. Per Oculus Apum (Through the Eyes of Bees) seen in the image above, is an immense 20m long by 7m wide tunnel and immersive installation to remind us how clever bees are. It will focus on glorious wild, organic bee-friendly flowers in vibrant colours like yellow and include an upside-down lavender field. This impressive, most striking display will be evocative of how bees see flowers in ultra-violet (UV). The flowers will form a canopy across the ceiling of the tunnel and curve in a half-turn helix downwards spilling out on to the floor in a wave shape. This will bring the walkway to life with an oscillating soundscape of the electrostatic patters that help guide bees to the flowers – the electric potential of a petunia flower-stem over time as a bee lands. Furthermore, London perfumer Miller Harris will be providing honey scents that will waft around the dramatically lit sculpture housed within the blacked-out tunnel area. This will all help form a thought-provoking, immersive sensory experience on many levels. The deeper message from Per Oculus Apum is to revel in the wonder of a bee’s life – and to inspire the conservation of these perfect little pollinators that play a vital role in our ecosystem. It is estimated that both installations will involve 23 of the highly skilful McQueens team working over five days to bring these designs to life. 2,500 plants, 6,000 Craspedia stems and 6,000 leaves for the wings will arrive for making the bees alone. McQueens Flowers has collaborated with Dr David Lawson, bee behaviourist at the School of Biological Sciences at the University of Bristol to help give insight into bees’ behaviour and their relationship with flowers. Find out more about McQueens Flowers here.